My first LightHawk mission in 2009 was planned to make images of areas in the Wyoming Range threatened by planned natural gas development. Back then, I was nauseous the entire time in flight and clueless about the speed and willingness to fail necessary to make good aerial images. Pilot Chris Boyer could hear my shutter clicks in the headphones and cajoled me to shoot more, shoot fast. That trip was a first step to many more LightHawk missions, each one with a specific conservation target. “The unique perspective of flight” is important in story-telling photography, the scale and sense of how all the pieces fit together can’t be shown any other way. It doesn’t replace traditional, on the ground image-making, but it’s a key part of conservation “documentary photography”. I had the privilege of flying with Chris again in February and look forward to many more opportunities with LightHawk, a great organization. What happened with the Wyoming Range? The Upper Hoback is protected and a 44,720 acre area known as The 44 is still in dispute – it’s all wild today. Posted in From The Vault, Greater Yellowstone Ecosystem, Photography on May 16, 2014 by Dave Showalter. “Pursue Ewe” A pair of bighorn sheep rams chase a ewe through sagebrush flats in the North Fork of The Shoshone River Valley. Shoshone National Forest, WY. What appears to be a larger bighorn ram chasing a smaller one is a bit of an illusion – there is a ewe behind the lead ram and they’re both chasing her. The chase during autumn rut lasted for several minutes at high speed in open country. Imagine my surprise when I edited these shots awhile after returning from the trip and saw two butts on the lead ram. However amusing, these creatures are amzingly athletic, even while running full-tilt through sagebrush. The peak of rut (mating season) for bighorn sheep in Greater Yellowstone is in the first two weeks of December. Posted in From The Vault, Greater Yellowstone Ecosystem on January 13, 2014 by Dave Showalter. Sandhill cranes with colts (chicks) feed in a wetland near the Hoback River. The area was severely threatened by planned industrial scale natural gas development and is now protected. A strong grassroots effort led to the purchase of the gas leases by Trust For Public Land, who retired them forever - giving the land back to the American people. The Rocky Mountain Population of sandhill cranes are Greater sandhills that migrate from winter range at Bosque Del Apache in New Mexico to Greater Yellowstone from spring through the end of summer, where they mate and raise their young. By September, these tiny colts are juveniles ready to fly 500 miles to New Mexico. 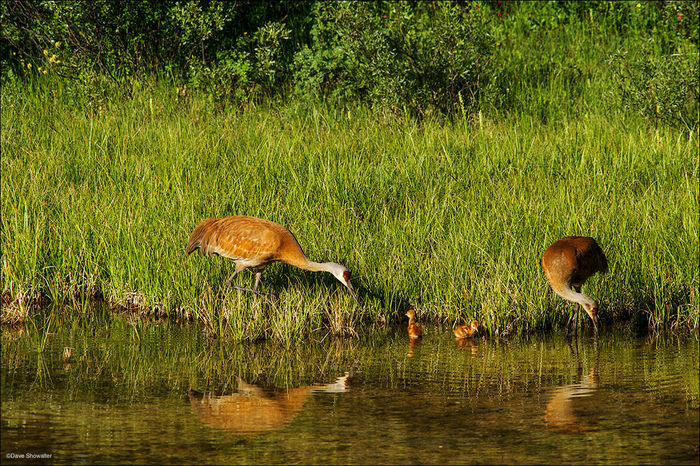 While shooting an assignment for Trust For Public Land celebrating the permanent protection of the Upper Hoback, Dan Bailey mentioned sandhill cranes with chicks. I said “Of course I’m interested!” before he was done asking. This family was on a perfect nesting site surrounded by water in a marshy wetland, next to the Upper Hoback River in southern Greater Yellowstone. The colts (that’s what sandhill crane chicks are called) were feeding around the adults, who weren’t concerned with the two-legged observers on the hill. Their second colt is to the far right. They didn’t like the coyote chorus that started up across the sage meadow, but went back to feeding as soon as the concert ended. It’s remarkable to watch these tiny colts raise their legs and peck for food just like their parents, although the adults were helping out with mouthfulls of aquatic vegetation. I’m preparing for my first trip to Bosque Del Apache NWR, winter home of the Rocky Mountain Population (RMP) that migrates between Greater Yellowstone and New Mexico. I might even see this family at Bosque. Around 20,000 of these prehistoric birds make the trip twice a year, just like they did when they flew over dinosaurs. You can’t help being fascinated with them for their strong family bonds, grace, human-like characteristics, and resilience in such a rapidly changing world. And although sandhill cranes are remarkably adaptable to change, it’s imperative that humans protect the most important habitat throughout the migration route to sustain another million years of migrations. Posted in Greater Yellowstone Ecosystem, Wyoming on November 13, 2013 November 13, 2013 by Dave Showalter. 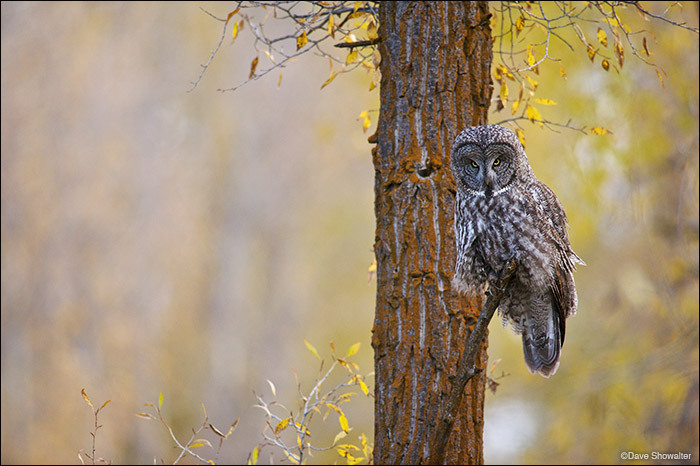 A great gray owl hunts with a backdrop of gold in Jackson hole. Great grays are our largest owl, standing as tall as 27'. This 'ghost of the forest' loafed in an aspen stand in the afternoon and became very active at dusk. Although considered uncommon, great grays can be spotted throughout the Greater Yellowstone Ecosystem. Posted in Greater Yellowstone Ecosystem, Wyoming on October 14, 2013 October 14, 2013 by Dave Showalter. 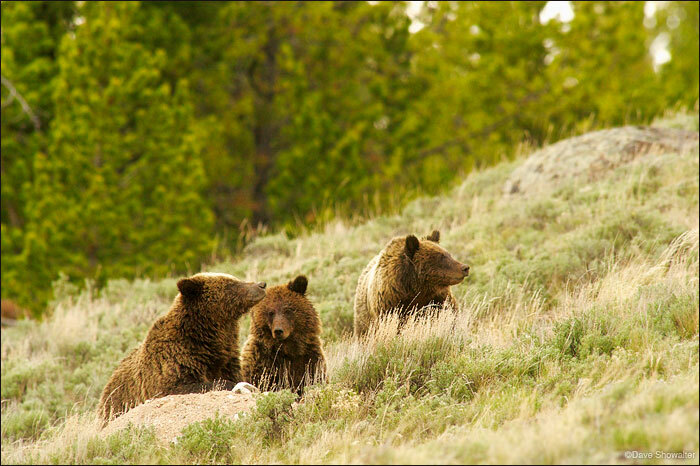 "Quad mom", a Yellowstone grizzly sow who had four cubs in 2010, rests on a hillside with the two surviving cubs, now sub-adults. I had just watched these rather large bears breast feed in the sage. They'll be on their own soon and the sow will mate again. Posted in Endangered Species, Greater Yellowstone Ecosystem, Wyoming on May 31, 2012 May 31, 2012 by Dave Showalter. Posted in Greater Yellowstone Ecosystem on February 27, 2012 February 27, 2012 by Dave Showalter. Have a wonderful, safe, and merry Holiday season ~ Peace, love and joy! Posted in Greater Yellowstone Ecosystem on December 21, 2011 by Dave Showalter. Presenting images from the third photo expedition for the Absaroka Tripods In The Mud project in November. It’s been a rewarding experience working with the Greater Yellowstone Coalition and ILCP so far and I’m looking forward to the next phase – hopefully, we’ll launch a traveling photo exhibit to help us protect the A-B Front. The November trip was dramatically different, with short days, big wind, wintery conditions, and ungulates beginning to move from the high country. Hunting season for elk and deer was still going on, so sightings were limited. I enjoyed observing bighorn at the start of mating season – sheep that migrate from Yellowstone. And although bears are supposed to be hibernating by early November, tracks were everywhere, as grizzlies continued to feed on gut piles left by hunters. Thanks to the Greater Yellowstone Coalition for sponsoring this Tripods In The Mud project – it speaks volumes for their commitment to protection of the A-B Front. Thanks to ILCP for supporting the initative and amplifying the call for conserving “Yellowstone’s wild side”. 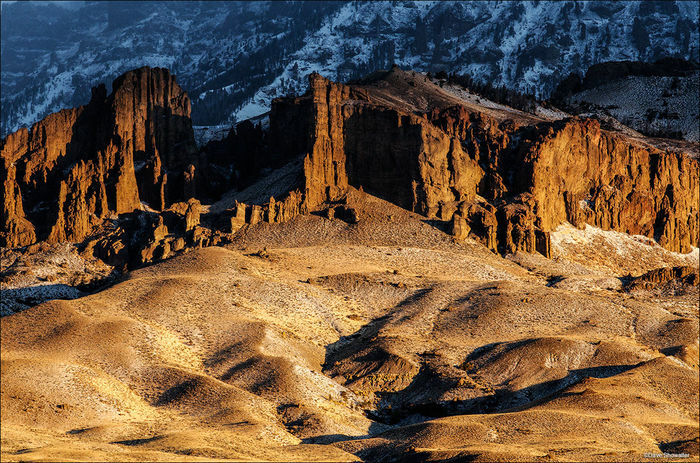 Volcanic breccia spires at the base of Jim Mountain catch golden morning light in North Fork Canyon. Posted in Greater Yellowstone Ecosystem, Photography, Wyoming, Wyoming Mountains on December 13, 2011 December 15, 2011 by Dave Showalter. I wrote this blog for the ILCP Tripods In The Mud site and thought I’d share it here too. A blustery November wind sends a chill through North Fork Canyon, which is of no concern to mating bighorn sheep. I visited the sheep for several days in a row to give our Tripods In The Mud story a heartbeat, thinking occasionally about the future of bighorns and their rightful place as a Rocky Mountain icon. Mostly, I was just trying to make compelling images of a majestic creature that migrates from Yellowstone National Park to grassy winter range in North Fork Canyon. It’s natural to focus on the big rams with their full curl that wraps under the eye. That’s what I was doing when this juvenile approached me and looked straight into my lens, captivating me with his translucent eyes. The moment lasted for a burst of images, just a few seconds. Posted in Greater Yellowstone Ecosystem on November 30, 2011 by Dave Showalter.